During the hot summer days, it’s important your air conditioner reaches below 80 degrees. But why is my air conditioning not cooling below 80? Find out why. Home is where we want to be. It’s our place to relax and unwind. We like to be comfortable in our homes. So when we can’t feel a difference between the hot, sticky, summer air outside, and the temperature inside, that’s a problem. A big problem that needs to be fixed STAT. There are a few things you can do on your own before you call a repairman. They are simple things that homeowners should know how to do for regular maintenance on their air conditioners. If your filter is loaded with dust and dirt, it could be causing your air conditioner to not run effectively. If you haven’t changed your filter lately, now might be the time to do so. Filters keep dust and other contaminants from building up in your air conditioner. Your air conditioner has to work significantly harder when the filter is dirty. You should be changing your filter every 3 months. That might sound like a lot, but it will really make a difference in how well your air conditioner works. And clean air filters reduce allergens in the home, and that’s definitely a good thing. This may sound so simple and basic, but we’ve seen it before: check the thermostat. You’d be surprised how often a homeowner thinks, “Why is my air conditioning not cooling?” Just to find that their thermostat was just set on the wrong setting. If you’re system still isn’t working, you may need to recalibrate your thermostat. You can test this by tapping a thermometer next to the thermostat. Wait 15 minutes and if the reading is different, you’ll know your thermostat is off. Also, note where the thermostat is located in the home. The front room with the big windows is going to be significantly warmer than the dark hallway. Your air conditioner may not be kicking if it’s located in a cool location all day. The condenser is the outdoor portion of your air conditioning system. A lot of homeowners like to plant shrubs or ground cover around the unit. This can cause obstructions and block the air flow. Clean out any leaves, stems, branches, or grim that may be around the outside of the condenser. Note: Do not stick your hand inside of it! If you notice anything inside, can a professional HVAC company. You could get seriously injured if the system were to turn on while you were cleaning it out. Also, check for water around the condenser. If you see water this may indicate that there is a blocked drain line or crack. If you can’t figure out the answer to “why is my air conditioning not cooling,” it could just be that the circuit breakers may have tripped. Check the circuit breakers on your main power distribution panel. Reset all the breakers marked for the air conditioner. 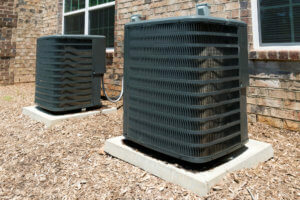 They may be labeled as the condenser, compressor, AC, Air Conditioning, or HVAC. If this doesn’t work, then you may need a professional to diagnose your HVAC problem. If none of the above suggestions work, you’ll likely need professional help to get your house cool and comfortable. Here are some things that could be wrong with your system. Refrigerant is the special chemical that cools the air. If there is a leak, your system will become low and refrigerant and the amount of cooling that can be provided will be very limited. If you notice any of these, let the repairman know. Sometimes when we get to the site we realize that the original system that was installed is just too small for the space it’s trying to keep cool. If this is the case, the unit will always struggle to reach the desired temperature. There is a simple test called the Manual J Calculation that can be done to figure out the exact tonnage needed for your home. Leaky ductwork includes small cracks and faulty connections. Ducts can often look good, but could also be the reason you are losing cool air. Leaky ducts are also expensive because you are paying for all the cool air that escapes. In fact, the US Department of Energy states that leaky ducts can cost you hundreds of dollars a year in high energy bills. You’ll definitely want to make sure your ducts are in working order. Sadly Air conditioning systems age. If it’s past the 10-year mark, you may need to start considering getting a new system within the next 5 years. Most systems only last 15 to 20 years. And even if it is only 10-years old, you may end up saving more money by getting a newer, more efficient system. There are lots of reasons why your air conditioner might not be working like it should. It can be hard to diagnose exactly what the problem is so don’t hesitate to call us at (402) 731-2727. We can help you with any problem that may arise. And trust us, we want you comfortable in your home as soon as possible. Because you know, we all need that place to relax and unwind.